As a family owned business, we believe in supporting the people who are working hard to make our communities better places. This holiday season, we’re excited to partner with two great organizations, Eblen Charities and Carolina High, to keep local families warm. November 19th – December 25th stop by either Frugal Backpacker location to donate a gently used coat. It’s the perfect way to use your holiday shopping for good, and as a thank you, we’ll give you a coupon for 20% off a new coat. Read more about the organizations that your donations will benefit below. If you’ve spent any time in the Asheville area, you’re no doubt familiar with Eblen Charities. For the last 27 years, they’ve offered crucial financial and practical assistance to local families dealing with difficult circumstances. As temperatures drop, their coat closet is vital to making sure many WNC residents are able to stay warm and healthy. 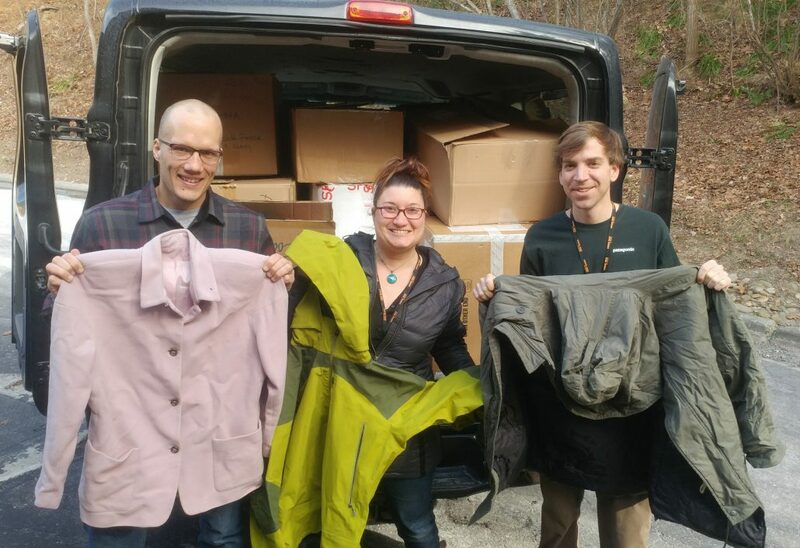 All coats donated at the Asheville location of Frugal Backpacker will go to Eblen Charities. In addition to collecting coats for Eblen Charities, Frugal Backpacker will be donating new clothing to support their numerous community outreach projects. On Tuesday, December 4th 20% of the day’s sales will be donated. Nothing warms our hearts quite like stories about young people working hard to bring about change. After noticing that many of their classmates didn’t have access to quality clothing and footwear, seniors at Carolina High decided to launch a community closet as their senior project. The Carolina Closet makes clothing, footwear, toiletries, and food available to students and their families. Since the school has a 100% poverty index, these items are much needed, and are valuable to helping students thrive. All coats and footwear donated at the Greenville location of Frugal Backpacker will go to the Carolina Closet at Carolina High. Thanks to your generosity, we collected over 500 coats last year. This year, we hope to be able to donate even more.